Black Dogs Publishing, London, UK, 2015, 160 p.
Border Cultures presents a critical insight into a complex and shifting notions of ‘borders’ and ‘boundaries’ via the work of a plethora of exciting and established artists working both nationally and internationally in the field. The contemporary practitioners featured in the book are those who took part in Border Cultures, a research-based platform for artists and cultural producers to explore and examine the concept of the ‘border’ through different lenses, which took place in three part consecutively from 2013 to 2015 at the Art Gallery of Windsor, Canada: Border Cultures: Part One (homes, land) in 2013; Border Cultures: Part Two (work, labour) in 2014; and Border Cultures: Part Three (security, surveillance) in 2015. The objective of the series was to mobilise and connect ongoing critical dialogues concerning ‘boundaries’, with multiple and diverse explorations from different parts of Canada and the world. 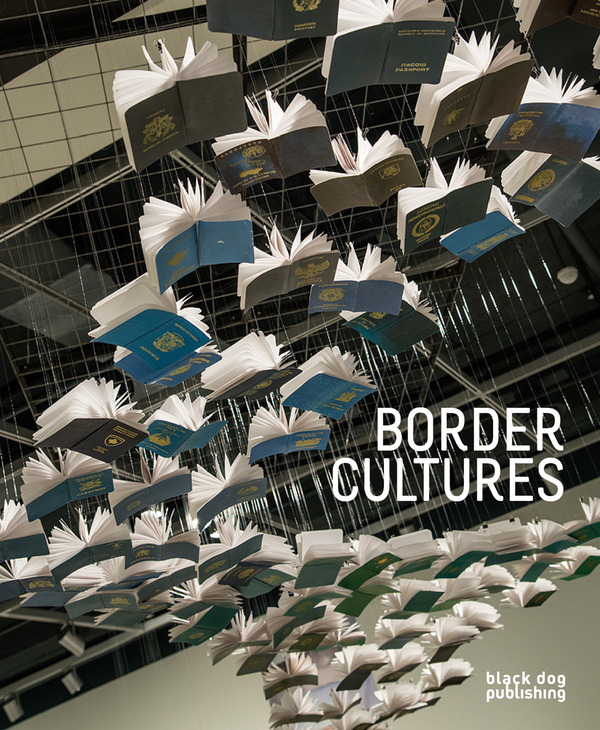 Border Cultures continues these narratives, collating essays from Dr Lee Rodney and Bonnie Devine, a curatorial essay from Srimoyee Mitra, and multiple artists’ reflections on the themes of the exhibition series. Broken City Lab (Canada), Campus in Camps (Palestine), Iftikhar and Elizabeth Dadi (USA), Willie Doherty (Ireland), Marcos Ramírez Erre (Mexico / USA), Sanaz Mazinani (Canada), Christopher McNamara (Canada /USA), Dylan Miner (USA / Canada), Ed Pien (Canada), Leila Sujir / Maria Lantin (Canada). C.A.M.P. (India), Sam Durant (USA), Philip Hoffman and Marian McMahon (Canada), Marisa Jahn (USA), Reena Katz aka Radiodress (Canada), Margareta Kern (UK), Kero and Annie Hall (Canada), Vince Kogut (Canada), Min Sook Lee and Deborah Barndt (Canada), Ken Lum (Canada), Dylan Miner (Métis), Precarious Workers Brigade (UK), Martha Rosler (USA), Andrea Slavik (Canada), David Taylor (USA). Bambitchell (Canada), Yto Barrada (Morocco / France), Patrick Beaulieu (Canada), Rebecca Belmore (Canada), Mahwish Chishty (Pakistan / USA), Harun Farocki (Germany), Chitra Ganesh and Mariam Ghani (Afghanistan / India / USA), Tory James and Alex McKay (Canada), Shelagh Keeley (Canada), Osman Khan (USA), Evan Lee (Canada), Victoria Lomasko (Russia), Dylan Miner (Métis), Trevor Paglen (USA), Camal Pirbhai and Camille Turner (Canada), Tazeen Qayyum (Canada / Pakistan), José Seoane (Canada / Cuba), Charles Stankievech (Canada), Hito Steyerl (Germany), Syrus Marcus Ware (Canada / USA), Tintin Wulia (Australia / Bali).